It was a miserable day and our expectations were for a relatively low sub 100 turnout. 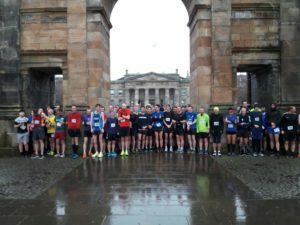 However a remarkable 127 runners turned up and completed the race and raised £314 for Social Bite, a homeless charity. Given the wind and rain, along with the cold from hanging about at the start, times were generally down on normal but we still had 8 finishers under 10 minutes. Before the race had even started many runner numbers had already began to disintegrate, so we often relied on memory or soggy numbers to record results. Despite that I think they are pretty accurate.